There was an influx of random shots on my Instagram recently. And each had an 'accidental' capture of the galaxy that was my nails (View MY galaxy here! Muahahahaha to the 'MY'!). But all good things have to come to an end. My nails grew faster than weeds and when a sudden job interview was scheduled, I knew I had to disown my galaxy. GLOOM. I visited Nailz Treats, morphed into a semi-alien with silver finger tips and within half an hour or so, was the epitome of elegance. Haha! I wish! 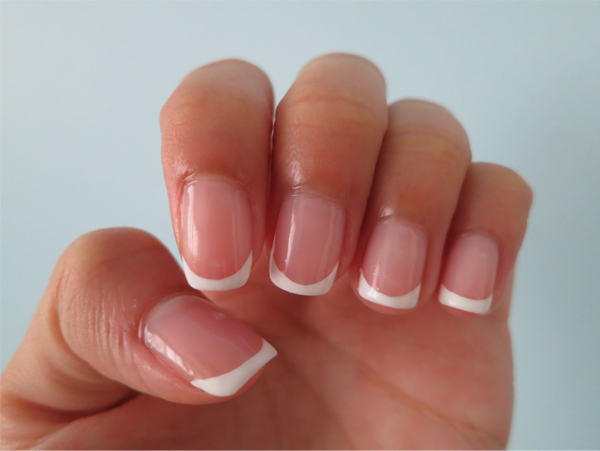 But anyway, this is the first time I'm having square-shaped nails and French manicure! *excites* I'm loving my nails so much that I have been brandishing them right in people's faces (Think: "YOU SEE? YOU SEE!!! Nice right?!?".). Elegance cost me $15, by the way. Colours used: O.P.I's Passion and some random (Just means that I forgot to take note of it. I'm sorry!) white nail polish from Orly.